Utelogy, maker of software for control, management, and analytics of audiovisual systems for business and education, has signed a partnership agreement with integration firm Communications Engineering Inc., (CEI). 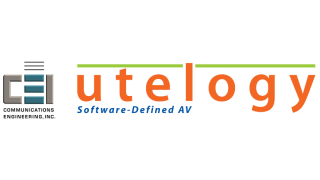 Utelogy is a creator of Software-Defined Audiovisual (SDAV) technology for smart classrooms, conference rooms, videoconferencing, and auditoriums. Using an open architecture, the Utelogy platform enables AV and IT departments to enhance the flexibility of class and meeting room technology for easier reconfigurations and equipment reuse. With its help-desk and remote monitoring capabilities, Utelogy also delivers operational enhancements. "We are pleased to have an innovative partner like Utelogy," said CEI president and CEO Lawrence Brody. "Like CEI, Utelogy serves clients with high expectations for their systems and facilities. This partnership brings the strengths of both companies together for a seamless customer experience."